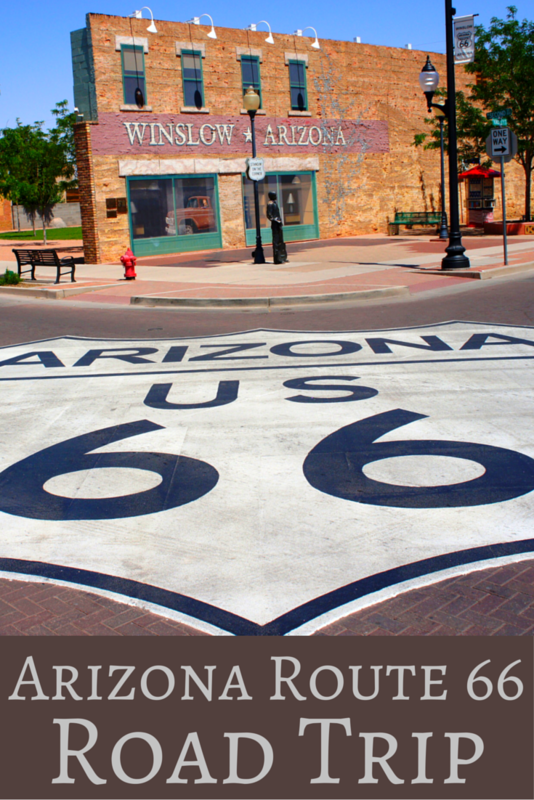 Arizona has the honor of having the longest stretch of Historic Route 66 in the nation. While there is not much left of Route 66 in the eastern part of the state, western Arizona has approximately 140 miles of uninterrupted Mother Road stretching from Topock to Seligman. 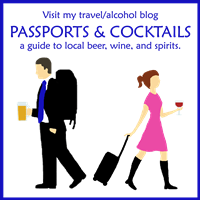 To celebrate Route 66’s 90th anniversary, we took a road trip along Arizona’s Route 66 and visited Route 66 attractions and towns. As soon we crossed the California / Arizona border we hopped onto Route 66. At over 50 miles, this is a pretty long stretch of Route 66 road. The biggest Route 66 attraction along this section is Oatman. There is a lot to do in Oatman, including touring an authentic gold mine, walking through the historic town, and seeing an old-time gunfight in the street. Be sure to visit the Oatman Hotel, where Clark Gable and Carol Lombard spent their wedding night, and its dollar bill plastered bar. Probably the most surprising thing you’ll see in Oatman is the wild burros that freely roam the streets. 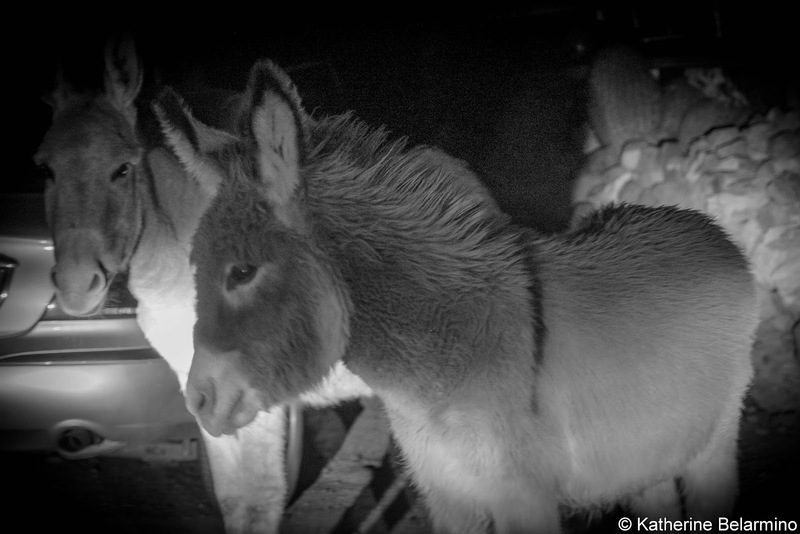 The burros are friendly and are protected by federal law as symbols of the American West. This part of Route 66, especially past Oatman, is curvy, so drive carefully, especially at night. Another point of interest along this section of Arizona Route 66 is the Shaffer Fish Bowl Spring, approximately five miles east of Oatman. Stairs lead up the hill on the side of the road to a small rock “bowl” which collects water that seeps through the rock from a spring. Route 66 continues through Kingman, which is also off Highway 40, and then veers away from the highway for another 80 plus miles. The first roadside stop along this stretch of Route 66 is Antares Point, home of Giganticus Headicus. 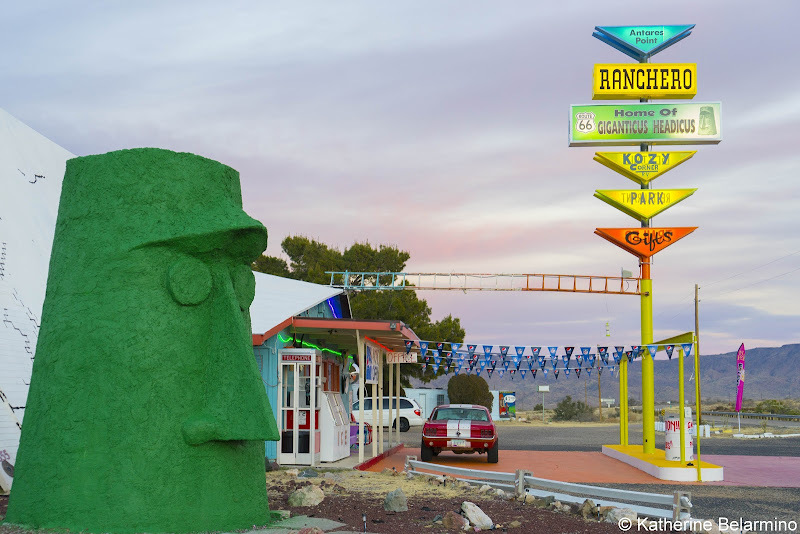 Why this 14-foot tall Tiki head was placed on Route 66, we don’t know, but it is definitely the type of kitschy Americana that makes a US road trip special. Giganticus Headicus is painted pink in October for breast cancer awareness month. The rest of the year it is green. 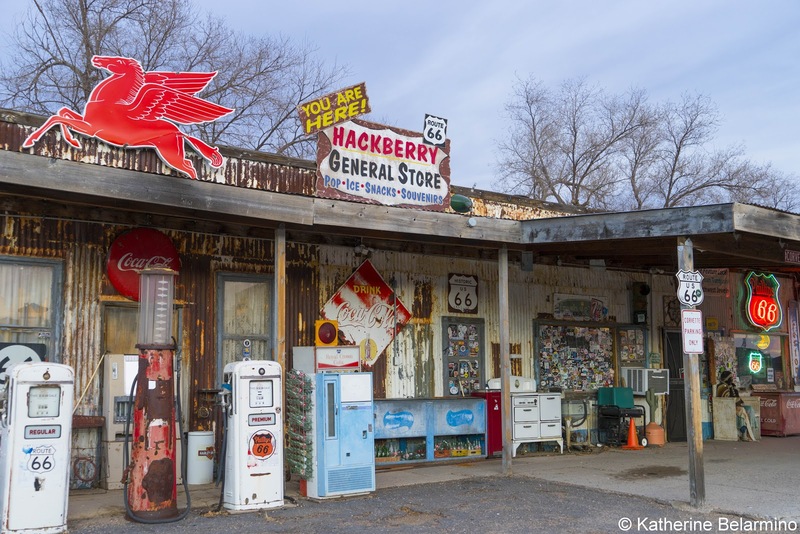 A few miles past Antares Point is Hackberry, home of the famous Route 66 Hackberry General Store. Outside are gas pumps and old cars from the Route 66 era. It is both a store and a museum of the Mother Road. Beyond Hackberry is a town that used to be, Valentine. The Valentine post office was famous for its heart-shaped postmark. Today visitors can visit the Valentine Indian School site, the remains of one of the many Indian schools in existence between 1870 and 1930, boarding schools which the children of Native Americans were required to attend, leaving their homes and families behind. Also in Valentine is Keepers of the Wild, a rescue sanctuary for exotic wild animals that are rescued from or surrendered by private owners. 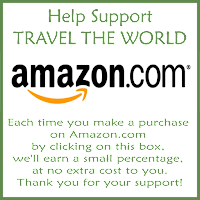 Other stops along Route 66 from Kingman to Seligman include Truxton, Peach Springs, and the Grand Canyon Caverns. Seligman is where Route 66 returns to close proximity to Highway 40. Seligman has shops and restaurants and is a great stop for Route 66 souvenir shopping. Somehow Seligman gained the right to proclaim itself the birthplace of Historic Route 66 and is the first town along this longest remaining stretch of Route 66 from Seligman to Topock. Heading east from Seligman, Route 66 is also Highway 40, so you’re back on the freeway. 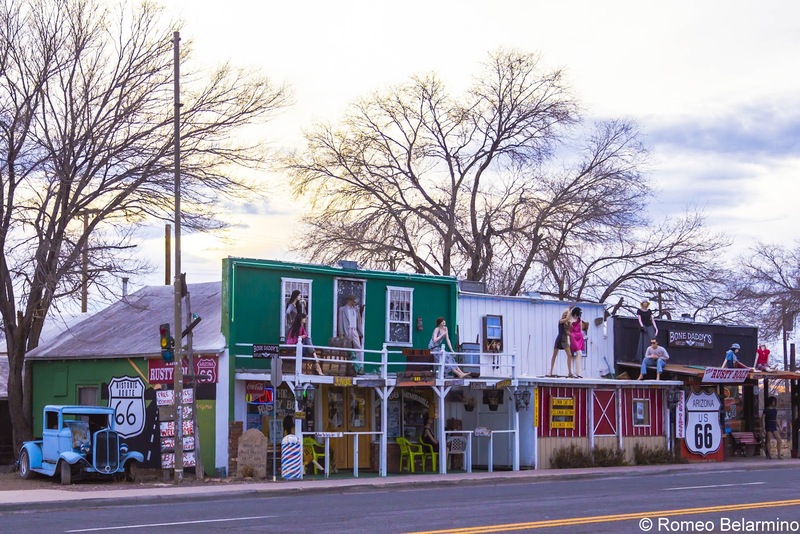 You can get off the Highway and follow a small length of Historic Route 66 through Williams, the last town in Arizona to be bypassed. Williams was finally bypassed by the freeway in 1985. Williams is a great little Route 66 town to visit, filled with many blocks of restaurants and shops and Route 66 memorabilia. During Route 66 days, Williams was also a popular gateway for travelers wanting to explore the Grand Canyon. East past Flagstaff there is very little opportunity to drive along the original Route 66. However, there are quite a few fun detours between Flagstaff and the Arizona state line that Route 66 travelers would have enjoyed during their travels as well. One of these unusual detours is Meteor Crater, the world’s best-preserved meteorite impact site. 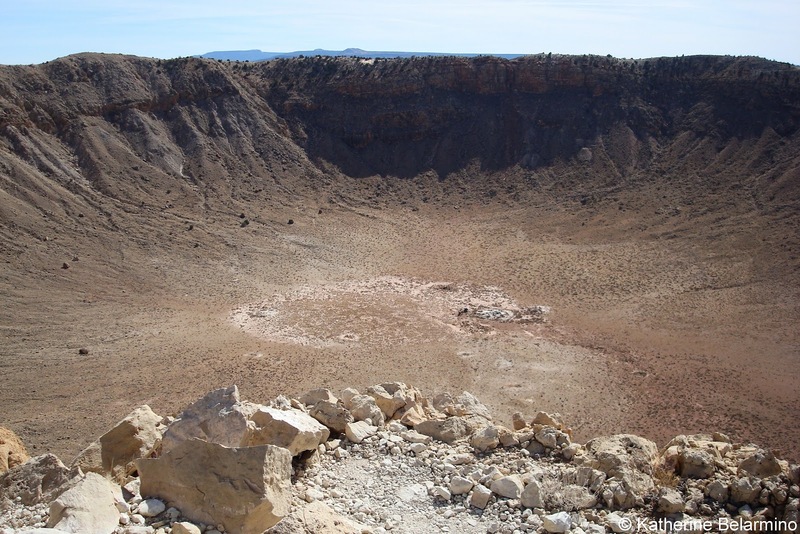 The meteor crater is what you would imagine, a really big hole in the ground. The crater is one mile in diameter and over 550 feet deep. The visitor center offers a movie, exhibits, and a piece of meteor rock. After the visitor center, join a guided rim tour and learn more about this crazy phenomenon. On the way to Meteor Crater make a stop at Twin Arrows for a Route 66 photo opp. The next piece of Old Highway 66 travels through Winslow, Arizona, made famous by the Eagles song Take It Easy. Eagles fans will want to be sure to stop at Standin’ on the Corner Park, complete with flatbed Ford. Another must-see in Winslow is La Posada Hotel & Gardens, an old Harvey House that has been lovingly restored into a gorgeous hotel with one of the most delicious restaurants, the Turquoise Room. Arizona has a National Park along Route 66, the Petrified Forest National Park. The Petrified Forest gets its name from the petrified wood that can be found throughout the park. Millions of years ago, logs were washed away and buried in mud and debris, quickly cutting off oxygen and allowing for an extremely slow decay process. Minerals were absorbed into the wood, which then crystallized, causing the wood to be replaced with quartz. The petrified wood looks just like logs and stumps and sections of tree trunk, except they are rainbows of color. The Painted Desert Rim Drive also passes through a Painted Desert. Arizona has so many Route 66 attractions, it’s hard to see them all in one road trip. 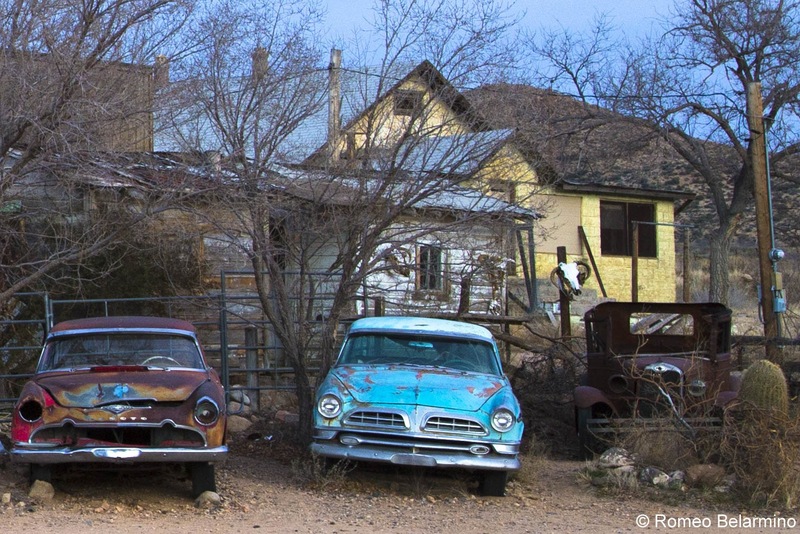 A road trip along Arizona's Route 66 is like strolling down memory lane, except it is the memory lane of families past who took this road trip so many decades ago.